In our coaching work, we at Kenning often see dramatic personal transformations unlocked by seemingly obvious changes. For instance, I recently worked with an enormously talented junior partner at a consulting firm (I will call him “Adrian”) who kept missing flights. It’s easy to see how this habit caused Adrian a lot of pain, not just in managing an already complicated work schedule, but also in protecting his personal time and even his health; sleep, diet, and exercise all took a hit as Adrian bounced from flight to flight. Each change extracted a toll of time spent cooling his heels in airports – and threw his schedule into confusion. The fix for this problem seemed obvious: Show up at the airport a little bit earlier. However, just offering this straightforward advice was not much help. Adrian, a smart cookie, already knew that was the solution. The tricky thing turned out to be surfacing the reasons why Adrian couldn’t just take the advice he was already perfectly able to give himself and felt compelled to make choices that did not seem to be in his best interest. As a start, over a period of weeks, Adrian kept track not just of when he missed flights but also of the times more generally when he was “late” for calls, meetings, or other appointments. Together we tried to reconstruct the specific decisions that led to the lateness, and explored the feelings and assumptions that made those decisions feel “right” at the time. Doing so gave us a vista into a complicated landscape of feelings, habits, and assumptions. In some ways, cutting things close and scrambling at the last minute was for Adrian a way of re-enacting the habits of his much-loved but chaotic and chronically disorganized family of origin. Racing to the airport under-prepared and already behind schedule produced in Adrian a stressful adrenaline rush that while unpleasant in many ways was also at least familiar. It put him in a place he knew how to be, because he had spent many years there growing up. There was more to the story, though. In addition to his reflexive attraction to mad dashes, Adrian had great difficulty pulling himself out of whatever he was engaged in at a given moment to consider the bigger picture. A voracious problem solver who felt at his best untangling complex knots, Adrian dove into interactions heart and soul. Everything disappeared in the face of the seductive opportunity to be his best self, fully alive, maximally energized by the ego-soothing rush of having impact. More simply put, Adrian valued “having an impact” in the moment more than “having an impact” over time. The “now” was visceral and immediate. The big picture seemed abstract, and acting to protect it felt like surrendering an opportunity for a kind of affirmation he craved. Faced with this imbalance, and holding tight to the implicit assumption that total impact over time could not be more satisfying than impact in the moment, of course Adrian stayed put too long and, inevitably, missed all those flights. Armed with this new self awareness, Adrian was able to make small experiments to test his implicit belief that impact in the moment was more satisfying than impact over time. He worked to recognize when he was about to make a choice that would result in a chain-reaction of lateness, and to then “choose” to value the long-term by disengaging. He supported these belief-system experiments with a handful of simple behavior modifications. He kept a watch in a visible place. When he was scheduled to leave a meeting or call in 15 minutes, Adrian forced himself to say, out loud, “I need to leave in 15 minutes,” and to then make explicit agreements on how best to use that time. When he felt an anxious knot in the pit of his stomach when the time to leave came, Adrian trained himself to think “leaving now will make me more effective and happy over the long haul,” and he left. The behavior changes alone would not have worked, but combined with a new understanding of the sense-making systems that underwrote his actions, Adrian was able to consciously reshape his “operating model” and make different choices. 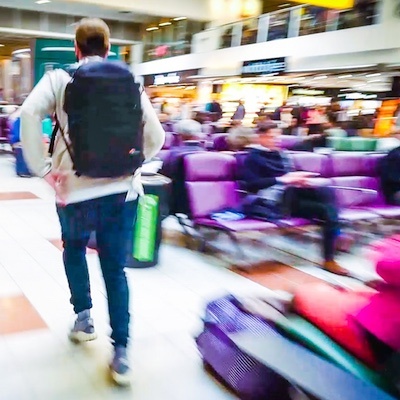 Adrian quickly experienced the payoffs of not missing flights, and more generally of making the unnatural and uncomfortable choice to disengage when it was time for him to move from one meeting to the next. He now reports feeling enormous pride at managing his time more effectively, and his collagues no longer see him as someone who is constantly in a rush, riding the edge of exhaustion, and trying to do too much. > A case for coaching: What’s in your wallet?